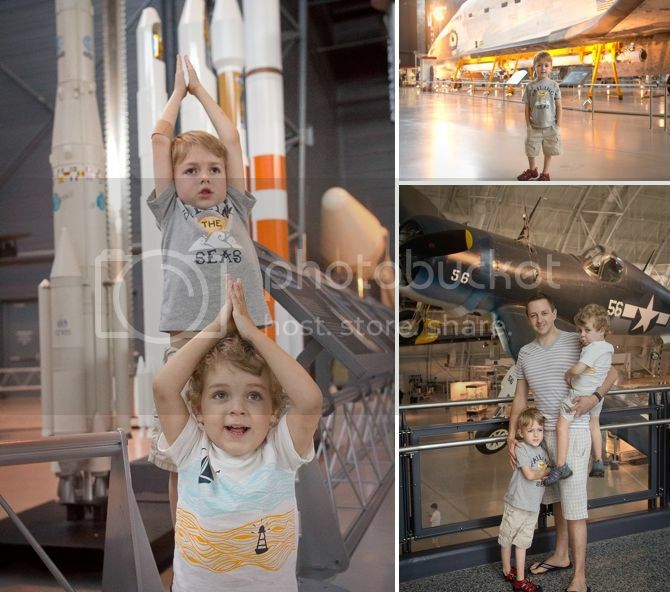 Whenever we talked about Virginia--Finley was quick to remind us that he wanted to go back to the Air and Space Museum. I'm not sure what he was so excited about... although I suspect it could be the small TV showing a clip of Transformers. I think he may have tricked us. Either way, we had a nice time spending a morning there when we were back in Virginia. We went on a Friday morning, so it was fairly empty. It's such a great museum to take kids to--there's tons of open space so they can run a bit freely and look at all the cool planes. These pictures are with the retired Space Shuttle--it's just amazing that it's been in space. It's massive and very very cool. We managed to get a decent family picture out of it too! Those are few and far between. I'm pretty sure it was about the Transformers. Pretty sure. Henry really only likes the small TV with the two minute clip of transformers too. And in my opinion, I really can't enjoy the museum any more unless there are hot chocolate bars and endless dessert trays.